Transformational piano music to assist conflict resolution in a group setting, between two people, or within oneself. Music for Intimacy, from Sound Feelings, is a downloadable .mp3 or FLAC intended as an adjunctive, supportive, entrainment music tool to help with relationships, emotional armor, indecision and balancing male and female energies. As tension in the music gradually becomes harmonious, the listener may experience a parallel relaxation and release of the armor that limits intimacy. May also be helpful for infertility. THIS IS INTIMACY TO HELP RELATIONSHIPS, CONFLICT RESOLUTION AND RESOLVING CONFLICTS. HELP WITH EMOTIONAL ARMOR AND INFERTILITY. INDECISION OR INDECISIVENESS USING NATURAL HEALING AND ADJUNCTIVE TECHNIQUES BALANCING MALE AND FEMALE ENERGIES. THESE ISSUES OR PROBLEMS DURING BEDTIME OR DIVORCE USING ENTRAINMENT MUSIC AND MIND/BODY MUSIC. 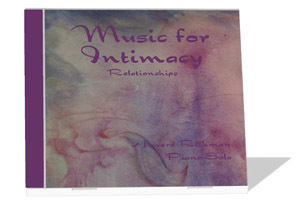 MUSIC FOR INTIMACY FROM PIANOS WITH SOUNDS OF SUPPORT. THESE TAPES ARE TOOLS OF TRANSFORMATIONAL MUSIC FROM HOWARD RICHMAN AT SOUND FEELINGS. Listen to a Sound Sample. Please be prepared for the “entrainment” transitional effect of this special music. so people can find out how to buy the full version. To save the file to your computer, right-click on a PC and option-click on a MAC. MP3 Playing Tips: Sometimes your mp3 player might start playing the song before enough of it has streamed into your computer, causing the sound to break up. Try “pausing” your mp3 player for a few seconds before you “play” to let the stream build up. If you don’t already have an MP3 player on your computer, you can get one for free from http://www.winamp.com/ (for Windows) For Mac, download iTunes for free. The musical entrainment process creates a type of sound “mirror” that first reflects the current stress or turmoil of the listener, and later reflects the desired mood and feeling. As the music gradually transforms, its resolution may be experienced in the listener, physically or emotionally. No Hypnosis or Subliminals — Only Music. There is no hypnosis, affirmations, subliminal messages or guided imagery embedded in the track. The music incorporates the broadest range of melodic, harmonic, rhythmic, structural and dynamic shifts and contains only piano music. See the Uses and Applications for Music for Intimacy. Listening Suggestions for Music for Intimacy. Please click here for educational information about this very special music. Here you can learn the details of what to expect. This Product Available by Credit Card, PayPal or Google Checkout Only. We Accept Visa, MasterCard, American Express, Discover, Carte Blanche, Diners Club, En Route, JCB, PayPal and Google Checkout. Available INSTANTLY. After you make your payment, you will be given a password which will allow you to download the .mp3 or FLAC version of Music for Intimacy. You will then be able to hear the complete track on your computer. If you prefer, you may use your CD burner on your computer to burn a CD of the track, which you then will be able to play on any CD player. Howard Richman, Teacher/Pianist/Sound Researcher, has blended his advanced music training and his intuitive awareness to create music for transformation since 1982. Mr. Richman’s specialty is to help people break through their most stubborn blocks. He performs and speaks throughout the United States and abroad. For more information, it’s possible that your question has already been asked by someone else and you may be able to find a quick answer by looking on our Q&A page. Otherwise, please contact us. Please see our 11 helpful free tips show how to listen to music for transformation and healing. Please see our other sound healing products. Please see our Research Articles. If you are a health professional, please see our integration guidelines. Also, please see our links to other great sites about intimacy issues, conflict resolution, infertility and sound healing. Best sellers, newest products, hottest things that you absolutely must have. Copyright © 1996-2018 Sound Feelings Publishing, Tarzana, California, All Rights Reserved.